Studio 5380: KaDoodle Bug and Peachy Keen Stamps! So, light the candles, cue the music and get ready for a little bit of birthday fun! It's KaDoodle Bug's 2nd birthday and we have gathered some special friends to celebrate! Designers from Peachy Keen Stamps and KaDoodle Bug Designs are joining together to help make this occasion super special and we are thrilled that you could join us! If you arrived here from my sweet friend Sandra's blog, 365 Days of Cricut, then you are hopping along in perfect order. But, if not, you can go back to where it all started at the KaDoodle Bug Designs Blog so that you won't miss one wonderful creation. These photos were taken 2 years ago at Blake's (my sweet grandson) birthday party. * After cutting out and putting together the cute little birthday boy, I gave him some Peachy Cuteness using the "Wide Eyed Kids Assortment" (PK-450) stamp set by Peachy Keen Stamps. * I used the Peachy Keen Stamp Set "Lucy's ABC,s and 123's" (PK-156) to stamp the letters for Blake's name and the number 2 on his balloon. * I added some orange Stickles to his birthday hat and paper punched a bright yellow star for the front of his shirt. 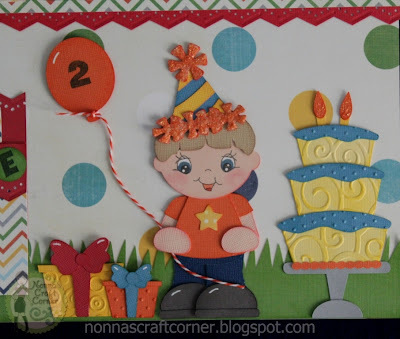 * The fun birthday cake got some fun embossing and a bit of Stickles for the candle flames. 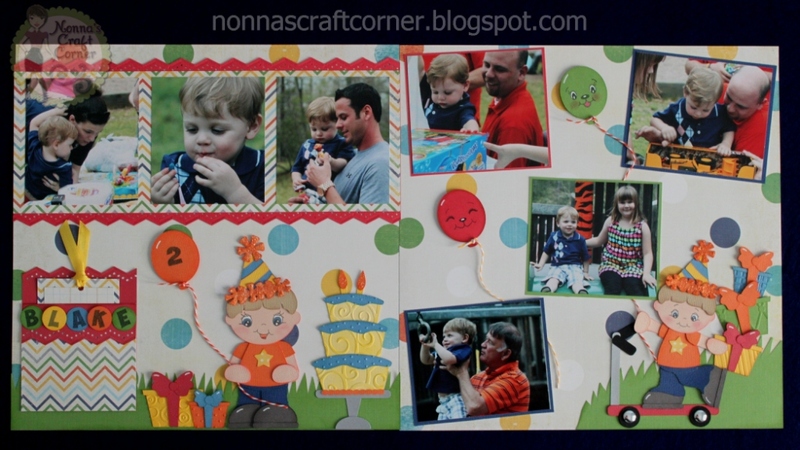 * I also pulled out several embossing folders and embossed all the birthday presents. * The cute little guy on the scooter is also from the "Birthday Party Kids" file. Isn't he a cutie pie? I just love those adorable little critter faces! * I added some fun, silver brads to the wheels of the scooter. * The balloons are all tied off with a bit of twine from Trendy Twine. And, there you go! Another birthday scrapped! With grandbaby number 4 on the way, I may never get caught up with the scrapping, but that's ok. I always enjoy going back, looking over old photos and reliving the memories. So, part of the fun a blog hop is the prizes....right? 1.) A $30.00 Gift Card to the "Peachy Keen Stamps Store". 2.) $20.00 Gift Card for normal price patterns at "Too Cute By Jessica"
3.) A Super Satchel Deluxe Art Bin ($39.95 value) by "Scrapadoodles Scrapbooking & Supply"
4.) $30.00 Gift Card for normal priced patterns at "KaDoodle Bug Designs"
1.) Leave a comment here wishing KaDoodle Bug Designs a Happy Birthday. 3.) Visit each of our Sponsors Facebook Pages and 'like" their page. That's it! We'll take it from there! The more you comment, the better your chances of winning, so be sure to drop by the KaDoodle Bug Designs Blog each morning through Saturday, March 9th for a new hop order, new blogs to visit and all new designs to inspire you! Oh Tanya! This took my breath away when I first saw it, and it just keeps having the same effect. There's so much wonderful detail to take in! I love every single bit of it! Beautiful work and Happy Birthday to KBD!!! Fabulous layout! All the pictures are perfect and all the elements surrounding (scooter guy, party hat, etc) it are perfect. 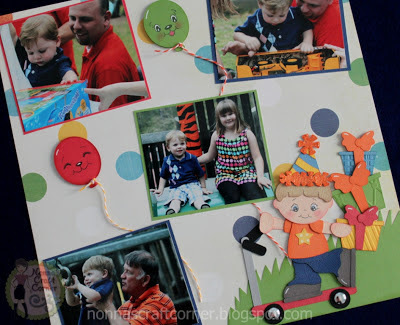 Love the way you matched the pics to the paper and it just looks amazing! Wow, what a beautiful layout, thanks for sharing, I am a new follower!! Another AWESOME project Tanya!! Your cuts and those PK stamps are AWESOME!! You are truly an inspiration!!!! Thanks for sharing my friend and have a GREAT day!! Adorable LO, loving the little scooter boys is way to cute. OMG! !This is such a DARLING LO! !Precious Critter faces...LOVE!LOVE!LOVE! Adorable little boy! Happy Birthday KaDoodle Bug Designs! Love the birthday cake on that layout. Happy Birthday Kadoodle! What a cute layout! What a darling page Tanya! Such an awesome layout! Wonderful to be in this blog hop with you!!!! Wow! These are very fun LOs!!! Your layout is amazing!!! I love all the colors and layout of it! Tanya I absolutely love your 2 page layout! You do beautiful work!! Beautiful photos too! Tanya I love your work!! You are awesome! Happy Birthday KadoodleBug!! Your pages are so adorable! Love them! This LO is just adorable Tanya! Those little boys are so cute and I love all the balloons! Love it! Happy Birthday Kadoodle Bug Designs! I just love your layout and all the detail and I love that you added alot of pictures. Hi Tanya,love,love,love your layouts. Love the cuts and adorable faces and of course your piccies. 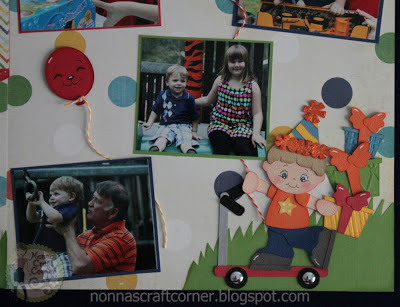 This is seriously cute...and I love kadoodlebug designs...they have cute cut files. You never disappoint! Oh my goodness Tanya, this is incredible! So CUTE and so FUN! I think you chose the most perfect cuts and details for this layout! It's AWESOME! Happy Birthday Kadoodle Bug Designs.. Love your layout and LOVE the color choices.. Your layout is spectacular! I love all the embossing and super fun colors. Happy Birthday KadoodleBug Designs!!! Great layout. IT is so nice to know what you used for everything. How precious! I love how the little boy looks so much like your Grandson. You make very beautiful layouts. Such a fun layout! Love all the details you've included! Inspirational layout! Great layout. Happy Birthday KaDoodle Bug Designs. Wonderful keepsake for your birthday boy! Love the LO. The detail work is awesome! such a cute, cute cut. and such a colorful LO. Tanya ~ Oh my word this is so ADOREBLE! I LVOE your pages you did for your grandson's birhtday! The cuts and so PERFECT for a little boy and the hops theme too! Well if he isn't the CUTEST little thing ever!!! Just LOVE all the faces you used too! ADORABLE! What an adorable layout!! Love the cut files that you used and the fab and bright happy colors. Tanya, Super cute layout. Seems like he was just born. Love the embossing on the cake, it looks yummy! WOWZERS girlie...this is FABULOUS! I love the fun colors, pics and of course all the cuts~ So darn cute and you just brought this all to life with those adorable faces! Spectacular!!!! 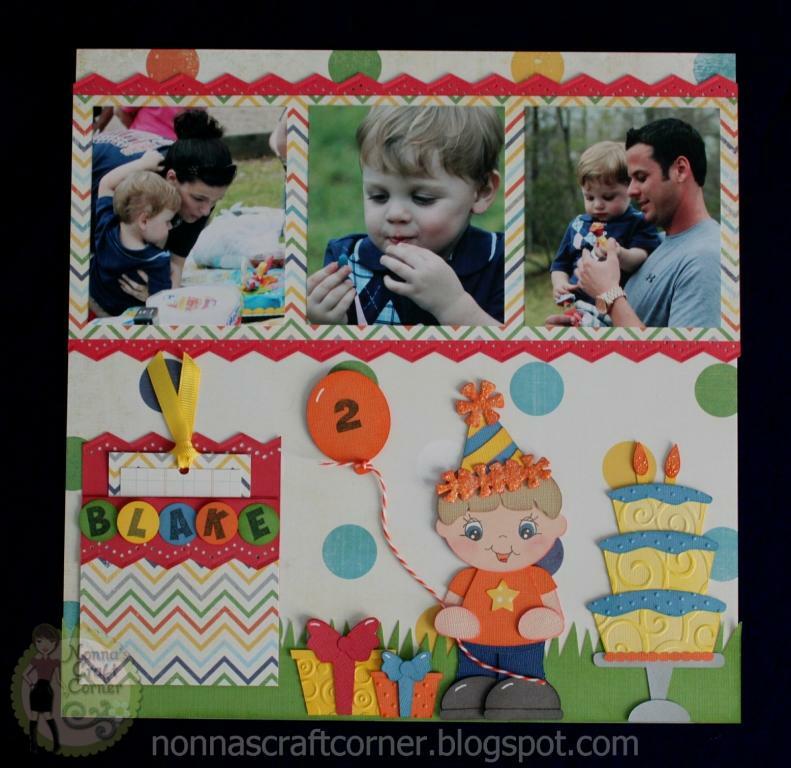 What an incredible layout - and just PERFECT for showcasing all those wonderful pictures from Blake's second birthday! The little details you've added are fabulous - especially those adorable faces! OMG! That had to take 4EVER! Totally worth it thought. You can see SO much love in these pages!!! Just wonderful! I've just started on my first scrapbook...being more of a cardmaker. I'm having a good time so far and your birthday theme and layout is some wonderful inspiration. I am trying to incorporate die cuts and svgs I make as well as images I have colored with copics. What a great idea to pull out my Peachy Keen stamps that I have forgotten about.